It is sadly ironic that, perhaps the most successful hunter on the African plains, the African wild dog (Lycaon pictus), now finds itself on the brink of extinction. Previously found in diverse habitats across the continent, it’s has tragically disappeared from much of its former range. Today there are only an estimated 3,000 to 5,500 wild dogs left in the whole of Africa, a mere 500 of which occur in South Africa. To know the joy and thrill of Africa’s “painted wolf” and how effortlessly they run. With their slender frame and long thin legs, heads held low, they are built for speed and can reach an estimated 60 kilometres an hour during a hunt. Wild dogs are ‘coursers’ in that they do not stalk their prey, but use both pace and stamina rotating the lead, to exhaust their target. 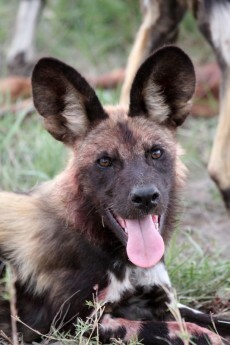 As unique as a human fingerprint, every wild dog has its own distinctive colour pattern. With big rounded ears and unique personality, their striking markings come in combinations of black, white, faun and tan, although almost without exception they have white-tipped tails. Whilst both males and females look alike, it’s the male that is slightly larger. Their teamwork is exemplary. Africa’s most efficient hunter is also its most sociable, for the strength of the species lies in the tight social structure of the pack, enabling the adults to nurture their young and hunt effectively. For many years, they were classified as vermin in South Africa and rewards were offered for their elimination! And if this was not enough, wild dogs were systematically eradicated from national parks and other protected areas by wildlife managers, the general consensus at the time being that it was necessary in order to build up the region’s dwindling herds of antelope. In Botswana’s Okavango Delta, the community either poisoned or shot them on sight because they believed the dogs would kill their livestock and threaten their livelihood. That the wild dog has survived is nothing short of a miracle. In South Africa, a handful of isolated groups survive, scattered across a few protected areas. To add to their fragile situation, a new and depressing phenomenon has raised its ugly head – over the past five years a growing, unregulated trade in wild dogs with the East is further depleting their numbers. 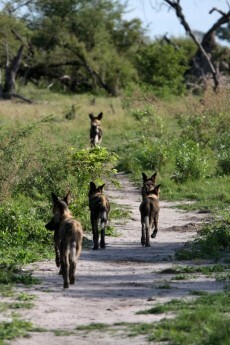 Wild dogs are highly specialised hunters. Teamwork, speed and stamina make them formidable predators on the African plains. So next time you are in search of a bit of speed, excitement and a rare encounter, from the Madikwe to the Masai Mara, we’ll be there to assist. Gorilla's spend most of their life (40%) resting, 30% moving and 30% eating.